The St Moritz Match Race, an official stage of the Alpari World Match Racing Tour, has been postponed to 2014 due to a lack of commercial funding for the event this year. 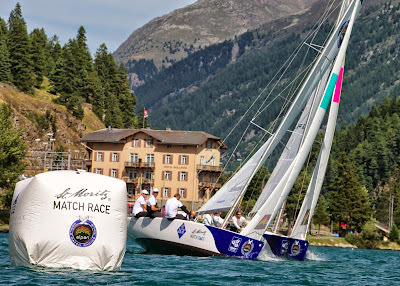 During its 10 years on the international sailing calendar, the St. Moritz Match Race has crowned some of greatest champions of sailing as ‘King of the Mountain’ including Ed Baird, Mathieu Richard, Torvar Mirsky, Adam Minoprio and Ian Williams. The event has also made it possible for some of the best Swiss match racing teams, including the Monnin brothers (3rd in 2007), to compete on the world stage.